Philly Cheesesteak Chili made with butter seared ground beef, bell peppers. onions and classic chili flavors topped with provolone cheese. 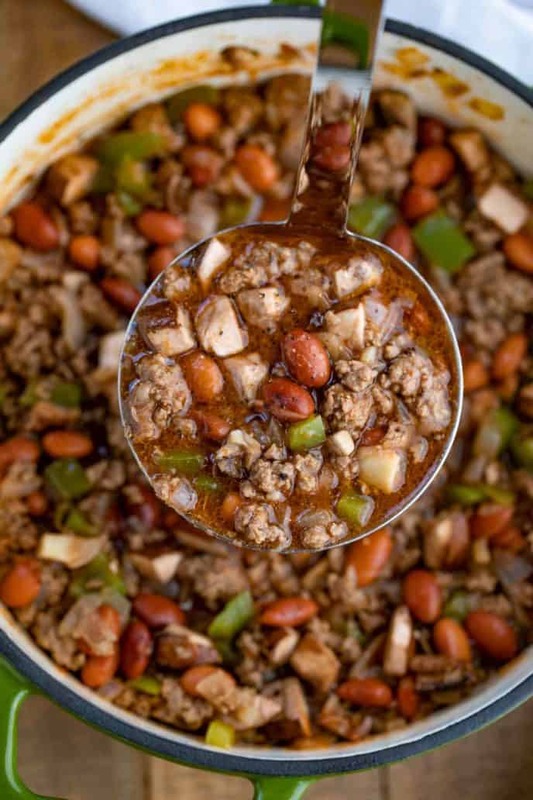 The perfect combination of classic Philly Cheesesteak flavors with your favorite Chili recipe! 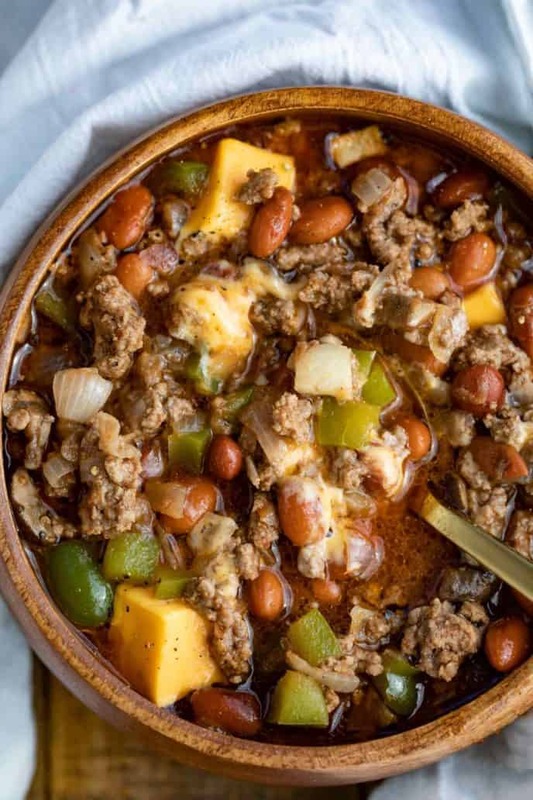 This Philly Chili is a marriage between my favorite Philly Cheesesteak and my Slow Cooker Beef Chili and I have to say I love this recipe as much as I loved the Philly Cheese Steak Sloppy Joes the moment I tasted it. This recipe is… AMAZING. If you’ve been a reader of this blog for any period of time you know my affinity for all versions of the Philadelphia Cheesesteaks. Before you guys mention this in the comments below…. yes, I know this isn’t how people make a Philly cheesesteak. Yes, I know a Philly is made with thinly sliced ribeye. Yes I know most people don’t use green bell peppers or mushrooms. I absolutely know most Philly cheesesteaks don’t have pinto beans in them….but here is the thing I really want to stress, it doesn’t have to follow the rules of 1 classic recipe. And this is pretty important for me at least. Food is fun, and this recipe… IS FUN. So much fun, it tastes like biting into a cheesesteak dipped into the juiciest bowl of chili. Now, if that is wrong, then I’m okay with it. But, if you’re like me, that doesn’t sound wrong, it sounds like a mashup I REALLY want to try. 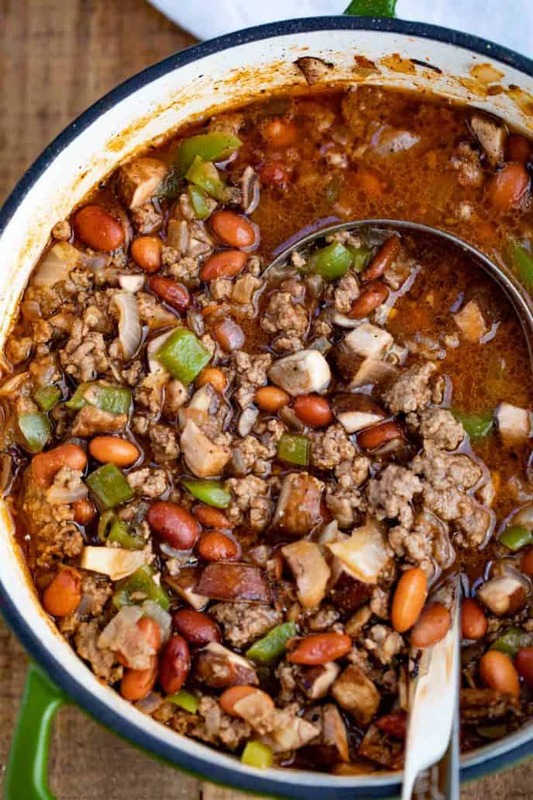 Sooo… Philly Chili everyone. I actually have a couple more fun cheesesteak flavored recipes coming but I made this recipe a few times and I took the photos yesterday and I just couldn’t wait to share them with you all. What’s in it? Beef that we sear really well with some butter, then some onions, bell peppers, mushrooms and Worcestershire sauce. I made this with all beef stock, but I’ve also tried it with beer like in my Slow Cooker Philly Cheese Steak Sandwiches and I went back and forth a half dozen times on which version to publish. I stuck with non alcoholic because I thought it was more family friendly but if you are open to beer I swapped out 1 cup of the stock for a cup of Heineken. It was darn good. The cheese was a part of the chili I tested a few times so here are your cheese options I thought worked best. Cubes of Velveeta – this is pictured above and worked amazingly, be sure to ladle some into your bowl, place a few cubes then ladle more on top to melt the velveeta inside too. Bread bowl with Cheez Whiz – In this version I spread a thick layer of the cheese spread onto a toasted bread bowl and the top of the bowl which made for great dipping and eating, it also helped bring out the original sandwich flavors more. 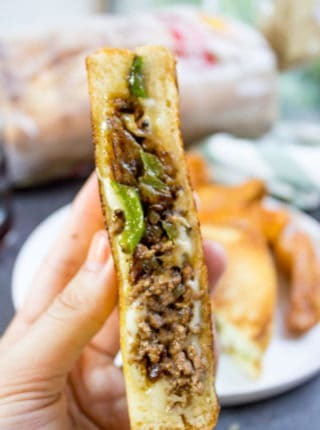 If this were a gameday treat or if you LOVE all things cheesesteaks I would at least try this method once. Provolone – this can be cubed or if you want you can place a slice in the middle of the soup or even just on top then microwave the bowl for 15 seconds. A great non Whiz option. Cheddar – An easy orange non Whiz option, you can add a handful of shredded cheese on top or add cubes in the middle. If you add the cubes remember the Cheez Whiz will melt significantly faster so in testing I added the cubes then microwaved for an additional 30 seconds to melt the middle cubes better. 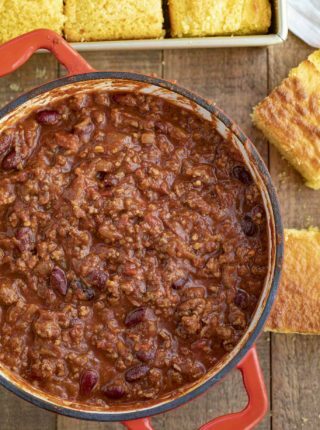 You can of course use the bread bowl idea above or a classic option for chili is Ultimate Cornbread or Perfectly Easy Dinner Rolls. In a large pot over medium heat add half the butter and the ground beef breaking it into larger chunks to keep the crumbles bigger and meatier cooking until you have a good sear on the beef, a nice golden brown (don't rush this or stir too often). Remove the ground beef and add in the rest of the butter along with the onions, bell peppers, salt and pepper and cook them until they are softened and translucent, about 3-5 minutes. Add the pinto beans, mushrooms, tomato paste, chili powder, beef stock and Worcestershire sauce and stir well. Bring it up to a boil, reduce to a simmer (low heat) and cook for 25 minutes then serve with cubes of velveeta in the bowl and on top. Canned chili beans, or canned Pinto beans? Pinto beans sorry. 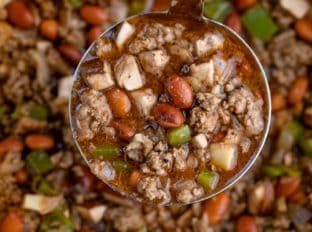 Chili beans are technically pinto beans in a sauce. 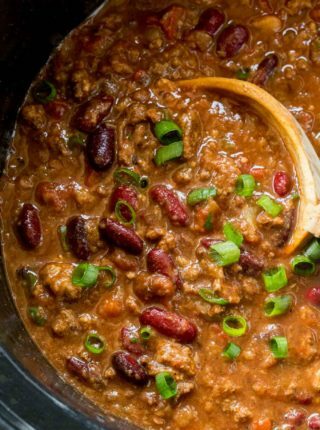 I used chili beans in the recipe so it was in my notebook scribble as chili beans but since I drained and rinsed them I listed them as pinto since that is really what you need for the flavors. I love that you have added all these extra veggies and you can’t go wrong with added Velveeta cheese. Now this is a must make! Love everything in this! 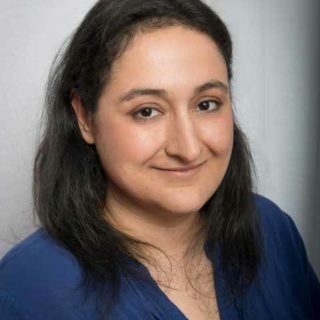 I hope you enjoy it, Krista! 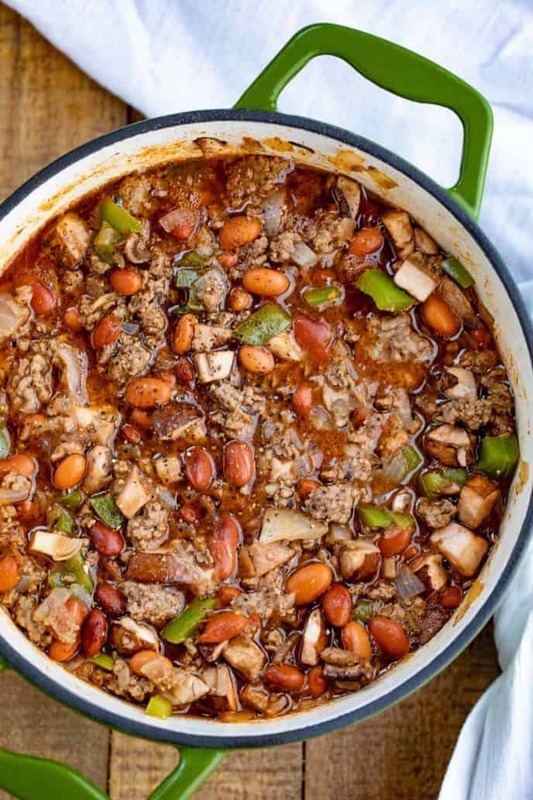 My Hubby is going to love this chili! It’s perfect for this snowy weather! What a hearty dish! I would like to have it for dinner tonight! That looks crazy good and full of flavor! This looks mouthwatering, I can’t wait to try this! So glad you enjoyed it, Dee! Thanks for the 5 stars. 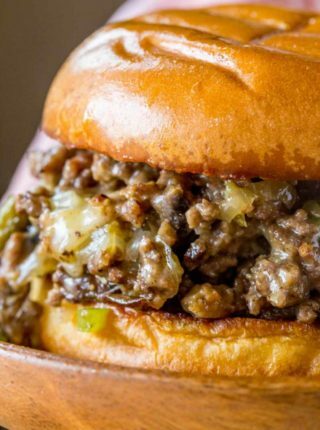 You are the Queen of Philly cheesesteak versions! I’m sure this one will be a hit like all of the others. You’re too sweet! Thank you.